Sweet Moments. Edited May 23rd 1:25 pm. The time is near. We're making our big move tomorrow.. Wow, tomorrow.. In some ways, it seems like it's taken tomorrow forever to get here and then others, it seems it's arrived in a blink. The walls around me are bare and there is quite a bit of evidence that tomorrows activities are definitely approaching. On the other hand, there are random things sitting around that I wonder if anyone would miss if I inadvertently tossed them in the goodwill box. I don't feel like those things should still be sitting there... I'm also wondering if I should run out and adopt a pet so when my furniture is moved tomorrow, I can blame the collection underneath it that will make it apparent that it has not been moved in three years on the said pet... No, my children will suffice. Seriously, do people actually move their furniture to clean underneath? Please, unless you are going to tell me no, don't answer the previous question. 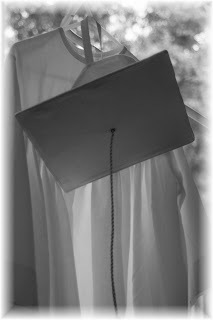 Also behind the screen of my laptop, (Which is sitting in my lap and gets rather hot by the way), waiting for the iron to heat, is a little white graduation gown that Emma will wear later tonight. It is little for a graduation gown but still bigger than what I feel should fit her at this point. In less than a month, she will be five years old and I am all too aware of how quickly the past five years have flown and know, but can't fully grasp, how quickly it will come that she will be wearing that even bigger graduation gown. If I were to try to keep things all pretty, I wouldn't tell you what I'm about to tell you but looking pretty is not really my style so I will go ahead and say, she has been a challenge lately. Just when I start to think she's grown, she reminds me that maybe she doesn't handle these situations like an adult by having a melt down like the ones that became famous about three years ago. Yes, a couple of times this week, she has reverted to a two year old and has let her emotions freely flow. I don't know that there has been a day go by this week with out a spanking. Yes, we do spank and no, I'm not up for a debate. We can save that for later if you don't mind. But last night, I was able to capture a sweet sweet moment with her. Adam and Emma went to get Adam's dad at the airport in Columbus (I'll tell you more about that in a minute). And when they got back home, Papa spent a few moments with Chloe, I put her to bed and then Adam and his dad went to one last late night movie with the teenagers. This has become a regular occurance that Adam has gone to catch a new release with the teenagers. And since I'm not much of a fan of theaters (I like my movies with a pause button for potty breaks) it's been fine with me to stay home with the girls. Well, on these nights, Emma goes to bed with me. So we went to bed and read the non disney version of Cinderella. I like the non commercialized version of fairy tales best. And after we came back to the real world when the story was over, Emma looked at me and said, "mom you're beautiful, you're the best mom ever". I mean, I'm sure the wicked stepmother helped me out some. If you think the your child is feeling that life isn't fair because you've almost beaten them into next week that day, just put them to bed with a Grimm's fairytale. That should fix things up real nicely. Anyway, it was a sweet sweet moment. And for a moment, I tried hard to view myself through her pure eyes and prayed for God to help me be only half what she believes I am. Don't worry, I'm not forgetting my sweet, sweet Chloe. Chloe is having some attachment issues. Seems she's only happy when she's attached to my hip these last few days. That has made for some interesting packing. It really hasn't bothered me much. She has been so independent that it's nice to see her differentiate between me and the average Joe. She has a delightful little personality. Yesterday while everyone else was gone, I sat down for a brief moment. She crawled over to me. I picked her up, she leaned in for a kiss and just before our mouths touched (I can't say lips because there isn't much lips involved in her kisses) she pulled away and grinned and shook her head no. I did eventually get a nice big kiss. Sorry Hannah but I just can't resist them. If I think time has passed quickly with Emma, it has flown with Chloe. Things have been crazy since Chloe was born. I'm glad that I've kept this online diary because there are moments that would have been forgotten without it. Since Chloe has been having separation anxiety, I was surprised at how quickly she took to Papa. They hadn't seen each other since Christmas but she didn't act like he was a stranger much at all. I don't know if it's because of the pictures that I show her daily in fear that her grandparents will be strangers to her or if it's the strong resemblance to her daddy whom she adores. She did shyly bury her head in my shoulder at first but it was only minutes before she was willingly crawling into Papa's arms. She even said Papa with precise clarity. Nana was scheduled to make the trip too. But Grandma, has had some complications. She had a heart attack last week and had open heart surgery on Tuesday. She is doing well thanks to all the prayers that so many of you sent up. Thank God for that! But Lynn is there with her mother right where she should be and she will meet us in South Carolina if things are going well. I think it will be nice for Papa do be able to do some catching up with her as far as time with the grandkids go since Lynn was able to come stay a week with us not too long ago. Please continue to pray for Grandma's recovery. Well, this post has become quite lengthy and I'm pretty sure that the iron is heated. We are so very excited about the journey that is ahead. I will write about that soon. But, I wanted to make sure that I didn't let these thoughts about the girls slip by. Thank you all for your prayers. We have a long couple of days ahead. I'll meet you again in South Carolina. Edit: May 23rd, 2008 1:25 p.m.
We have closed on the sell of our house here. For a few hours, we are homeless. Hopefully only a few hours. Somewhere in between 3 and 4 eastern time, we should become South Carolina residents. Can you become a resident without being there? Hmm. Well, we should own a house in SC. The uhaul truck is parked in the driveway. I'm trying to get the last few things together in the house. Adam and his dad have loaded a few things. Chloe is taking a nap. Emma is at a friends house. So maybe I will wait until I get to SC to make another post... Maybe not. I went back and read this post in the light of day. Seems as if I think a lot about "sweet moments" in the wee hours of the morning. I think I used both of those words at least a 50 times. So, I decided to change the title. Was at college in Troy Alabama major was Special Education which I changed a couple of times after that. Was dating Adam. 2. Finish a couple of photo orders. Ok, you're going to think I'm weird but I'd give all of it but about $150,000 away. Anything more would change my life way too much. And then my being thrifty skills would be wasted. But with that, I could pay off everything that we own. Who would I give it to? Well, if I was a billionaire, there would be plenty to spread around so get it line, when I get there, you're invited to the money parade. If I paid off everything I own I would be able to set us up for the future, the girls for college all of that stuff. So yeah, I really don't think money makes people as happy as they think it would..
1. caffeine. I've weaned myself off of it several times but I always fall of the wagon :). 5. leaving things open.. cabinets, books, doors, I don't know, I think I have a problem with finalizing things.